“We have heard of part-time job, part-time teachers, etc. Now, there is a new trend called part-time Muslim. As the name itself suggests, the part-time Muslim is one who practices Islam only at specific times or at certain places and this is increasing extensively. Some examples are the Mussalli who prays five times a day but in his daily business dealings, he cheats his customers by giving them defect articles. Or there is the sister who wears Hijab (veil) only when going to a Mayyat (funeral) but dresses exactly like the Bollywood actresses during a wedding. The above verse calls to people to enter Islam fully but just saying Shahada or being born and raise in a Muslim family do not make us a Muslim. Entering Islam fully means that we have to follow the teachings of Islam without any exceptions, without any reservations or without just focusing on one part and leaving the other on Allah (swt) to forgive. But let’s ask ourselves what Islam teaches us, how the life of our beloved Prophet (saws) was and his companions. Islam is a whole way of life and our Prophet Muhammad (saws) showed us practically how to live Islam in our daily life. We must act like Muslims also. Islam does not only include some rituals, customs and forms of worship but something more comprehensive, one that includes everything that governs our way of life, how we spend our life and what to do and what not to do, whether it’s our social events, our personal matters, the social and economic system, our relations to warfare. So everything is a part of Deen and since Islam is our Deen all those areas need to be governed as per Islam. 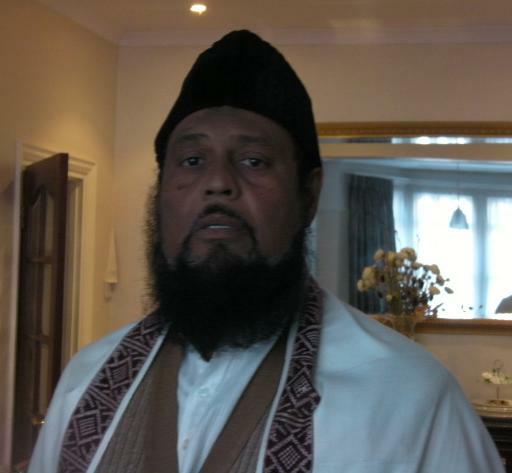 On August 25, 2011 LE MAURICIEN Newspaper, which is published from the Mauritius, carried an article by the Khalifatullah Hadhrat Munir Ahmad Azim Sahib on the extraordinary spiritual phenomenon known as Lailat-ul-Qadr (the Night of Decree). In the article, Hadhrat Sahib reflects upon the Divine Grace and Mercy in the last 10 days of the Holy Month of Ramadan available to the believers who engage in fasting and other acts of worship only for the sake of Allah, the Most High. We are reproducing below the article here for the benefit of all]. After having completed twenty days of fasting during this blessed month, the believer feels the deep connection between him and his Lord. He is altogether satisfied that he succeeded in fulfilling the commands of his Lord, of sacrificing many aspects of his life, all for the pleasure of his Creator. This sense of achievement is a boost for him to strive further to make the best of these remaining days when Ramadan will go away, leaving a big vacuum in his life. Like I have so many times said, Ramadan is a month of training; such a month in which he prefers to indulge in seeking the pleasure of God through numerous forms of acts of worship, to seek God’s forgiveness and His protection against Hell-fire. The Mother of the Believers, Lady Aisha (May Allah be pleased with her), the noble wife of the Holy Prophet of Islam (peace be upon him) narrated: “Allah’s Apostle used to practice Itikaf (spiritual retreat) in the last ten nights of Ramadan and used to say, “Look for the Night of Qadr (Decree) in the last ten nights of the month of Ramadan.” The last ten days of Ramadan, the month of fasting in Islam is also time for repentance of an exquisite aura. “He who dies without [recognizing] the Imam dies the death of ignorance”. This is one of the authentic Hadiths recorded and reported by several distinguished Hadith scholars, including Musnad Ahmad, Ahmad, Tirmidhi, Ibn-e-Khuzaimah and Ibn-e- Habban. In the same book, the Promised Massih (as) clearly identified the distinguishing qualities of the Imam and pointed out that Prophets, Messengers, Muhaddithin and Mujaddidin- all of whom invariably enjoyed divine converse- are the Imam of the Age in their times (p.39). By way of more clarity, the Promised Massih (as) further added: “But those who are not appointed by God to educate and guide God’s creatures, nor have they been vouchsafed such excellences, regardless of their being saints or seers, cannot be called the Imam of the Age” (p. 39). This is the express guidance left behind by the Promised Massih (as) through his eloquent commentary on the importance of accepting the Imam of the Age. Look at this example. Today, Ahmadis offer an interesting excuse to reject an authentic Hadith of the Holy Prophet Muhammad (sa) and the guidance of the Promised Massih (as) regarding the raising of an Imam in every Age. In his blinkered spin, the Khalifa himself is suggesting that he is the Mujaddid of the Age without ever claiming that he is a recipient of divine revelations or that Allah has appointed him to this position. He also feels that every righteous person helping the work of the “Jamaat” is a “Mujaddid” in his own right! 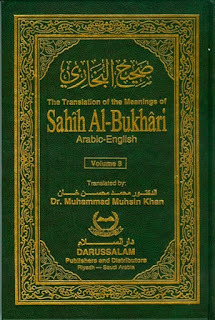 The coming of Prophets and other Elects of Allah for the guidance of mankind is a perennial theme in spiritual history. The Holy Qur’an says that such servants of Allah have always been raised among all communities and every people have had their own divinely-guided souls. “And for every people there is a Messenger” (10:48, 13:08; 16:37). A well known tradition from the Holy Prophet of Islam (sa) indicates that hundreds of thousands of Messengers have passed away before his own advent. Today, Ahmadis have completely moved away from the real spiritual path of Islam which anticipates the coming of Elects of Allah in every age. Forget about 10,000 Massihs or even the comparatively smaller figure 30 Massihs, mentioned by the Promised Massih Hadhrat Ahmad (as), his own so-said Jamaat has discarded his teachings by the way side. They do not even expect a single Massih to come in their midst now as they feel they have an elected Khilafat system which is designed to last till the Day of Judgement in the fashion of the Christian Khilafat. Already, they have declared the Promised Massih (as) as the Last Mujaddid before the Day of Judgement. Such thinking is in line with the mentality of other peoples of the past who also thought that after their Prophet, no one will come in future! 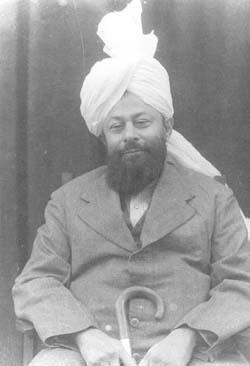 Most Ahmadis today believe that their system of Ahmadiyya Khilafat is the embodiment of Divinely- appointed spiritual leadership, as prophesied for and among the Muslims of the Later Days. This 'doctrinal' understanding and inherited belief is essentially based on what they have been taught by their leaders and scholars from the early days of the Khilafat system, invented by the Community. As is mostly typical within the Jamaat-e-Ahmadiyya Qadian, instead of individual Ahmadis thinking for themselves on religious matters, they are content with endorsing what they have inherited from their fathers. Almost every other Qadiani Ahmadi, unfortunately today, belong to this unthinking category of people, like the Qur'an speaks off: ‘We found our fathers following a certain course, and we are guided by their footsteps’ (43:23). So, the spiritual doctrines- their meaning, interpretations, nuances and implications- remain largely un-examined within the Community. 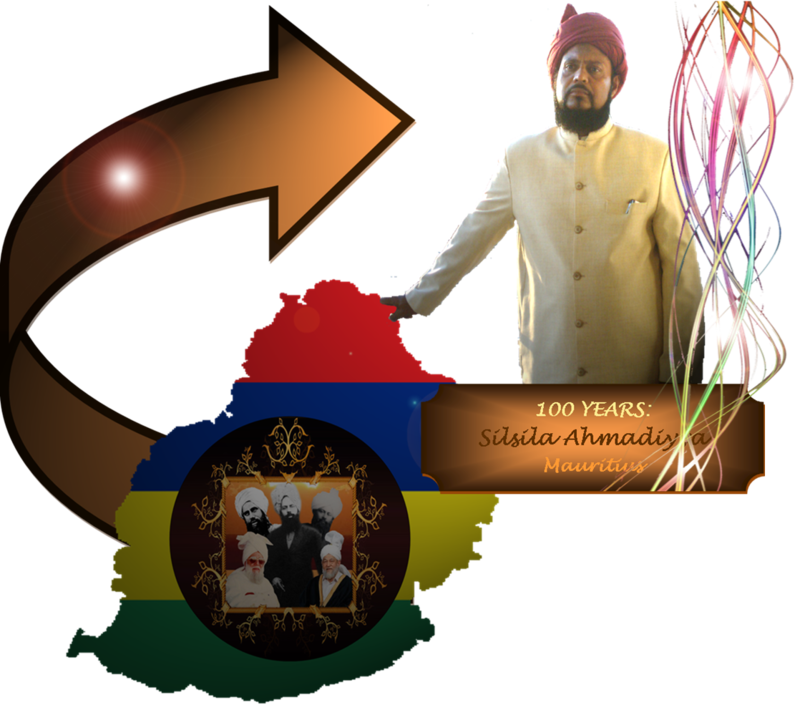 With the appearance of a new Reformer among the Ahmadis, with the grand mandate of being the Messenger of Allah of our times, in the person of Hadhrat Khalifatullah Munir Ahmad Azim Sahib (atba) of Mauritius, the intellectual landscape of Ahmadiyya theology is increasingly being redrawn. Ahmadi youth have begun to question their inherited religious notions and hitherto un-examined understandings and common convictions in the light of the Divine Manifestation and the spiritual light that emanates from his teachings. It is in this backdrop that we should view the recent series of articles/ extracts from the speeches of the previous Khulafa etc. 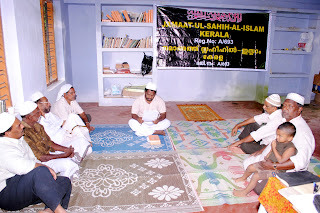 that are being published in the AL HAQ, the monthly organ of the Ahmadiyya youth wing Majlis Khuddamul Ahmadiyya, Kerala. In recent months, the journal is on a campaign mode among Ahmadi youth. The campaign objective is to instill the Ahmadiyya concept of Khilafat among the youth. Why do Ahmadis hold such a view?As the Holy Qur'an asks: "Do their intellect and reason enjoin this upon them or are they a rebellious people?" [52: 33]. The only plausible answer is that they merely follow certain statements issued and opinions expressed by the Ahmadiyya Khulafa in the past. Out of deference for, and veneration of, the Khulafa, they simply endorse what they are told without thinking about their spiritual validity or examining their doctrinal content. In short, they are just pursuing the path of the previous generations who preferred conjectures, instead of the certain knowledge encompassed in the Divine message of the day. It is interesting to note that Ahmadis are making the same mistakes against which the Promised Massih (as) used to warn the Muslim leadership of the day: clinging to the apparent meaning of certain prophetic traditions that metaphorically prevented the raising of Prophets after the Holy Prophet (sa). 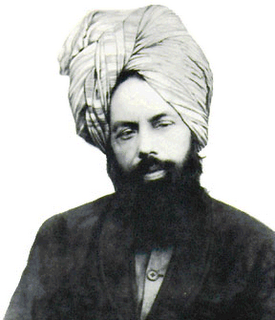 Indeed even today, clinging to such literal phrases and spiritual metaphors, the Muslim world opposes the coming of Prophets after the Holy Prophet of Islam.Indeed, “the Promised Massih (as) said that at the time of arrival of Prophets, people generally adopt two types of attitudes in spiritual matters: They apply metaphors to spiritual Reality and interpret Reality as Metaphor” (Urdu- Malfuzat, Volume 1, Page 586). Ahmadis today believe that Mujaddidiyat or the advent of Divine Reformers appointed directly by Allah the Most High has come to an end with the departure of the Promised Massih (as). They think that there is no scope for any Mujaddid to come in the new century of Islam as Hadhrat Ahmad (as) has claimed to be the Mujaddid of the Last Millennium. Based on this sole statement, Ahmadis today conclude that no Mujaddid will come in the entire Millennium. Those who take a second look at the statement will find: there is no Imam and no Messiah except the one who comes in his image”. It means that others can come so long as they are “in his image”. The door for spiritual elevation in subsequent ages is closed only in the case of those who reject the Elect of Allah of the day- the Promised Massih (as) in his era. In other words, Allah will raise the spiritual progeny of the Promised Massih (as) to all the spiritual blessings that are promised in the Holy Qur’an (4:70). The Promised Massih thus did not come to cancel the great Prophetic tradition about the coming of Mujaddidin in every century. Those who come after him will only confirm his truthfulness, they do not replace him. So while he remains the Mujaddid of the Last Millennium, others will come after him. This is how the Promised Massih (as) himself understood his claim, for he never claimed that Mujaddidin will not come after him. 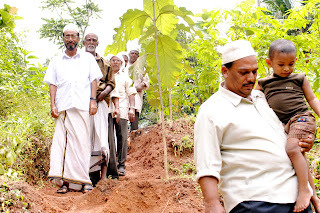 In his Friday Sermon of August 12, 2011 Hadhrat Khalifatullah Munir Ahmad Azim Sahib of Mauritius spoke about the larger message of Ramadan for the collectivity of believers or the Muslim Ummah. The signature tune of the speech was an impassioned plea for unity and brotherhood and harmony in intra-community relations. 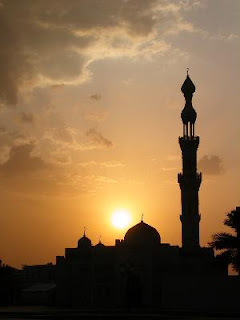 Fasting in this month of Ramadan being one of the pillars of the Islamic edifice, the Khalifatullah points out the extraordinary opportunity it represents to all denominational groups within the fold of Islam to rise above their differences and celebrate the spirit of Islam as One Community. “Brothers and sisters in Islam, let us live in harmony; harmony is not a slogan but a mission. Harmony does not fall from the sky like rain! This is a personal work that everyone should do; it requires an individual commitment; that is to put aside one’s own ego and not to promote our interests, but to promote the religion of Allah. Then uproot weeds in the garden of our heart – Hatred, resentment, jealousy, lust for power, the feeling of superiority towards our brothers and sisters in Islam, the belief that we alone are on the right track and the others are in the wrong – but what should be cultivated instead is tolerance, compassion, kindness, patience and forgiveness, forgiving others constantly. Ahmadi View on "Why & When a Reformer"
The Ahmadiyya Muslim Community today rejects the coming of Divine Reformers in Islam. However, in the official website of the Community -Al Islam-, under the aforesaid title, the following EIGHT cogent reasons have been published to convince the world of Islam that Divine Reformers [or Mujaddidin and other Elects of Allah] will continue to arise till the Day of Judgement among Muslims. “Some people think that since the Muslims have got the perfect book - the Holy Quran - to guide them no reformer is needed by them; they can get guidance from the Holy Quran by themselves. The idea is very erroneous and the facts of history do not lend support to it. In the first place, we observe that despite the fact that they have the Holy Quran with them they are deteriorating day by day. Discussions among them resulting in vast differences of opinion even about the interpretation of the Holy Quran are on the increase. No doubt they are conscious of the fact that they are going down, they do not find enough of strength to rise up and stand on their feet. This is exactly what we find in the history of previous religions; whenever their followers have deteriorated they have not risen by themselves. In the second place, the practice of God repudiates this idea, whenever darkness has enveloped the spiritual realm, God has been raising a Reformer for the guidance of the people. Look at the followers of Moses; they had a perfect book (according to the need of their time) which contained guidance for them. But whenever darkness enveloped them, they were given another guide in the form of a Reformer who reformed the followers of Moses. So much so that the Holy Quran says: We sent Messengers when he had passed away. In the third place what is actually meant by the perfection of a teaching is that God has mentioned all the ways of spiritual achievement in that specific book and all the needs (religious and spiritual) have been laid down with the ways they can be fulfilled. But if the human mind distorts it with its self-suiting interpretations, the book would lose its meaning for them and they would not be reformed by it unless the truth is unveiled by removing the curtain of self-styled interpretations. The perfect teaching is no doubt like a sharp cutting sword which cuts the sin asunder but there must be somebody who knows how to wield it. In the fourth place, however perfect and effective a teaching might be, unless an example of its implementation is shown to the people they cannot benefit from it. It is through the people of various spiritual ranks that God gives the people models for them to look at and follow them to their personal advantage. Sathyadoothan’ [in Malayalam, it means “True Messenger”] is the Malayalam organ of the Ahmadiyya Muslim Community in Kerala. 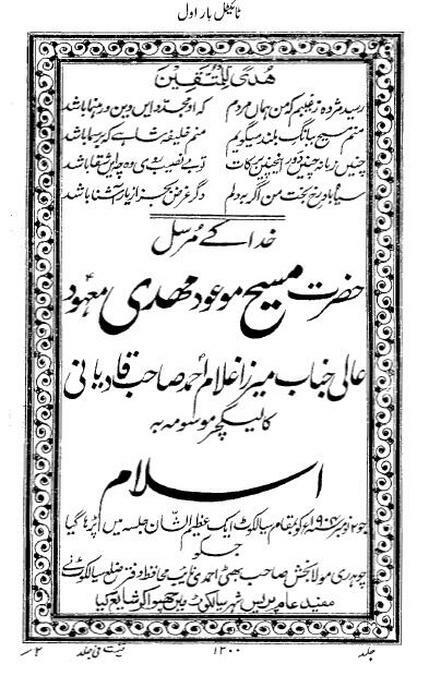 This venerable journal, established in the early part of the last Century by very distinguished Ahmadi elders, has had an enviable record of enlightening the people of Kerala on the mission and message of the Promised Massih (as) through its elegant articles. Of late, however, unfortunately, the journal is repeatedly drifting away from its high standards, even making blatant errors in the interpretation and understanding of the views of the Promised Massih (as). It is now virtually misleading and misguiding Ahmadis on the most important spiritual issue of the day: the future of Divine Guidance. In its quest for elevating the status of the current Khilafat arrangement in the Community among its common members, the monthly journal is on a campaign mode: that Allah cannot and will not raise a Mujaddid in the new century because the current and Fifth Khalifa is Divinely- appointed and guided. It argues that the status of the Khalifa is even above that of Mujaddidin who appeared in every century of Islam. And the institution of Mujaddidiyat is inexplicably dismissed as a mere “temporary phenomenon” that happened to last through the entire Islamic Era. 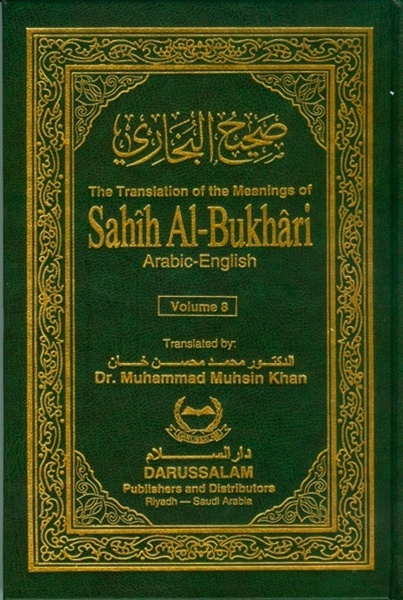 Astonishingly, it put the Khilafat of early Islam (that lasted only 30 years after the death of the Holy Prophet Muhammad (sa) and in spite of its perceived absence for over a millennium from among the Muslims) as the “enduring phenomenon” which made a reappearance after the death of Hadhrat Ahmad (as) with the institutionalization of Khilafat in the Community in 1908. While dismissing the very need for Mujaddidin in the presence of the “permanent” Ahmadiyya Khilafat, the Journal is cautious enough to acknowledge that prophets can come even in future as the Holy Qur’an keeps the door open for revelation and prophethood through its several verses. It begets a pertinent question: Will the coming Messenger of Allah not be the Mujaddid of his era? Why only the Khulafa elected by men can be raised to these Divine offices as Elects of Allah when the Holy Qur’an offers this possibility of spiritual elevation for ALL righteous believers? Even while describing Hadhrat Ahmad (as) as the Mujaddid of the Millennium, the current Khalifa of the Community is on record stating that an Ahmadiyya Khalifa can declare himself as the Mujaddid if and when Allah so informs him through revelation [Friday Sermon of June 10, 2011]. In other words, even the Khalifa does not believe that a Mujaddid will not be raised in future. This is in spite of what his own disciples and scholars of the Jamaat are expressly holding forth in their articles in the Sathyadoothan. “One of the signs of the Hour is the disappearance of knowledge and the prevalence of ignorance". "God Almighty does not take away the knowledge of Islamic Law and Faith by removing its books from His servants, but He takes it away through the death of scholars. When all scholars pass away, the public will make ignorant people their leaders; when they are asked about something, they answer without knowledge; they are misguided and they misguide others." In his book “The Victory of Islam”, Hadhrat Ahmad (as) confirms that within a century after the departure of a Divinely-raised Reformer, the community drifts away from the straight path of Sahih Al Islam. Through their grand theological discourses over satellite television and Internet, these leaders misguide the people when they seek guidance on spiritual matters. That is because they speak without knowledge and without divine guidance. Truth be told, none has exceeded Mirza Masroor Ahmad Sahib, the Fifth Khalifa of the Ahmadiyya Community, in paying a greater tribute to the wisdom and truthfulness of these prescient prophecies about the state of spirituality in Islam over time! Through his ignorant pronouncements on Islamic Khilafat and the future of Mujaddidiyat in recent months (May 27 and June 10, 2011), Masroor Sahib is guilty of trampling upon the teachings of the Promised Massih (as) and worse, casting aspersions on the profound Divine Scheme of permanent Khilafat for Muslims. In order to perpetuate the mythical grandeur of the Ahmadiyya Khilafat and to preempt any doubts about its aura in the spiritual realm, the Fifth Khalifa has fed a very appealing story to the faithful: That Islamic Khilafat ended in 30 years, Islam was without its divinely-raised Khulafa for 1400 years and that the Khilafat was reestablished after the death of the Promised Massih (as). A common Ahmadi hearing this story would be forced to bend before the Khalifa as the poor man (and woman) was told that the Divine system has come out of the world after a period of 14 centuries and all blessings originate from there! Ahmadis need to awake from their bliss of ignorance if they want to know the true conception of Khilafat and the real teachings of the Promised Massih (as) in this regard. The Promised Massih (as) literally frowned upon the idea of 30-year Khilafat in Islam, pointing out that Islam offers permanent Khilafat for all times. A REVEALED POEM: Ya Ramadan ! In the name of Allah, the Most Merciful, the Most Kind. A night of this month is better than a thousand months. Bear with patience for the sake of Ar-Rahman. Glory be to Allah Who sent Ramadan as a mercy to mankind. It’s a purification of our soul, our heart, and our mind. To test our Sabr and fill our hearts with warmth. The seer of the Unseen, all He does know. The month of Spiritual rhapsody! Who sent Ramadan as a gift to mankind. [On August 02, 2011 LE MAURICIEN Newspaper, which is published from the Mauritius, carried an article by the Khalifatullah Hadhrat Munir Ahmad Azim Sahib on Fasting in Islam in the backdrop of the Holy Month of Ramadan under the Islamic Calendar. We are reproducing the article here for the benefit of all]. The most desired guest for the believers is the Holy Month of Ramadan. Believers are commanded to welcome this special guest with fear of God in their heart and purity of mind and soul. The Almighty (Allah) says in the Holy Quran: “O you who believe, fasting is decreed for you, as it was decreed for those before you, that you may attain salvation.” (Chapter 2; Verse 184). First of all, what is Fasting? In Quran and Hadiths the word defining Fasting is “Sawm” which means “to abstain”. In our current language, this means that we must not drink or eat, and abstain from sexual relations from the beginning of dawn till sunset. Fasting existed even before the advent of Islam, for all people before Islam received divine commandments to fast, even if the quantity and quality of the different fasts were not the same. Fasting is one of the fundamental pillars of Islam. The first pillar being the Shahada (Attestation of Faith), the second being Salaat (Prayer), the third being Sawm (Fasting – especially in the month of Ramadan where it is obligatory for a believer except if one is ill, on a long journey, and for the ladies who are in their menses, or pregnant or are breastfeeding their babies), then afterwards come Zakaat and Hajj. On July 23, Tahajjud prayers were offered, followed later by the Fajr Namaz. The Amir Sahib later led a study session on Hadith. At 11 a.m., Fazil Jamal Sahib read out the message (in Malayalam translation) of the Khalifatullah Hadhrat Munir A. Azim Sahib (atba). The original message was issued to coincide with the inauguration of the Noor’ul Islam Mosque and the three-Day Camp. Photos were taken on the occasion as a record for posterity. In the afternoon, Majlis Amila was held to review the Jamaat developments and to take stock of our programmes. The Meeting expressed satisfaction that our members are increasing and that the message is being spread in the state. The respected Amir Sahib encouraged members to generously contribute to our Muqaddam Fund instituted by Hadhrat Khalifatullah for the renovation of the Mosque. A special meeting of the Siraj Makin sisters took place in parallel to the Majlis Amila. In the evening, Dr. Thahir Sahib led a study session on the concept of “Roohu and Nafse” as found in the Holy Qur’an. Dr. Thahir Sahib pointed out that the term “Roohu” is found at 19 places in the Holy Qur’an and invariably, the reference was with the meaning of revelation. On the other hand, the term “Nafse” can be found in over 230 verses and the reference was with the meaning of soul. In his famous book “The Philosophy of the Teachings of Islam”, the Promised Messiah (as) has used the Qur’anic verse 15:30 to illuminate his point about the origin of the human soul, even though the verse in question has used the term “Roohu” with the meaning of revelation. 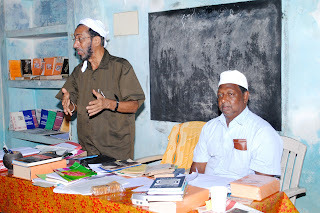 With the arrival of delegates from different parts of the State on the morning of Friday, July 22, 2011, at the home of Jamaluddin Sahib, the Amir/Jamaat at Mathra, the Member Registration Process began at 11 a.m. The Amir Sahib and his family informally welcomed everyone and interacted with all those who were present. By the time of Jum’ah prayers at 1.00 p.m., 17 persons were registered at the Counter, including a few non-Members. 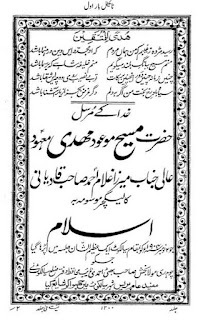 For the Jum’ah sermon, the Amir Sahib selected an important sermon of the Khalifatullah Hadhrat Munir Ahmad Azim Sahib (atba) that explained the coming of a Khalifatullah in the light of Qur’anic verses and the traditions of the Holy Prophet Muhammad (sa) and the explanations thereof by the previous Mujaddid, Hadhrat Ahmad (as). In brief remarks at the end of the sermon, the Amir Sahib formally declared the Three-Day Camp open. 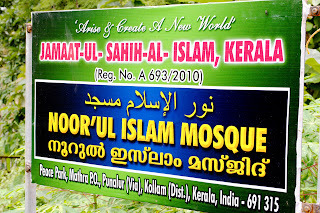 Jamaat Ul Sahih Al Islam, Kerala announced the historic inauguration of the Noor’ul Islam Mosque at Mathra in the south-Indian state of Kerala on Friday, July 22, 2011. 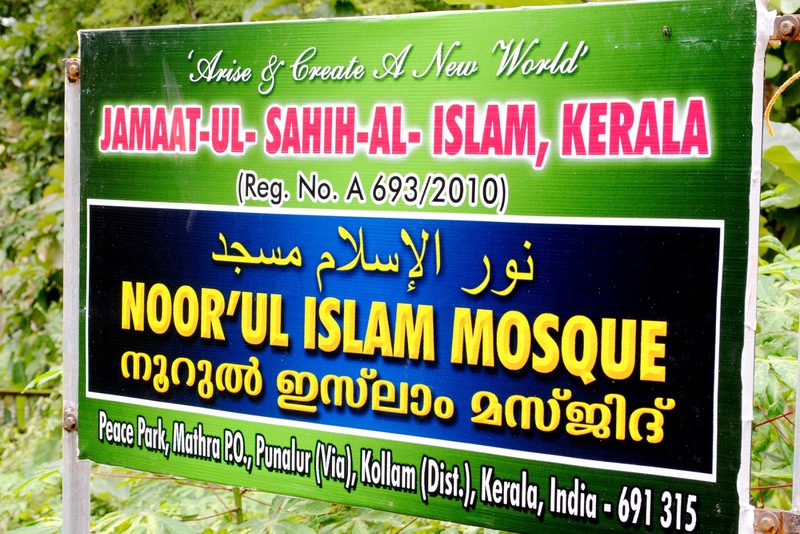 The inauguration of the Mosque represents a giant step forward for the nascent Sahih Al Islam Community in Kerala, which came into existence only after October 2010. The Mosque is a 400 sq. 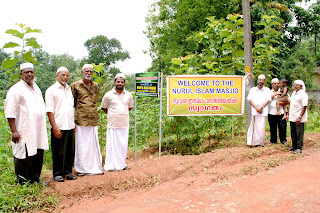 feet building, situated on a modest 20 cents of land (1/5 of an acre of land in Kerala) gifted to the Kerala Jamaat by the Amir Jamaluddin Sahib and his respected wife Shareefa Beevi Sahiba. Interestingly, the Mosque building itself has a rich history that is inextricably intertwined with all that is good and bad in the Ahmadiyya Jamaat. If we observe, all the present members of the Kerala Jamaat originally belonged to the Ahmadiyya Jamaat before recognizing and accepting the Divine Manifestation in the person of Hadhrat Khalifatullah Munir Ahmad Azim Sahib (atba) of Mauritius. Likewise, the present Mosque at Mathra was originally constructed by the Ahmadis of Kerala in 1990 and it used to be the local Ahmadiyya Centre for years.